So I'm really bad at making decisions. Like, horrible. Everything from big decisions such as choosing an apartment, to little decisions such as deciding what I want to eat at a new restaurant. So when someone on Twitter recently asked me about my favorite place to get a burger in San Francisco, I couldn't pick just one. I suggested Marlowe, NOPA, and Mission Bowling Club. Not quite cracking the top 3, but definitely my new addition to the list: Umami Burger on Union Street in San Francisco. If you're thinking to yourself, "I thought that was an L.A. thing?" You're kind of right. They have a ton of locations in the Los Angeles area, but this is the first in Northern California. Before we get to the burgers, let's talk sides. We got the beet salad just so we could feel somewhat healthy. And actually, as far as salads go, I really liked it. It was a truffled beet salad with truffled ricotta, smoked almonds, roasted beets, wild baby arugula and truffle dressing. But c'mon, you don't care about the beet salad. The. Best. Fries. Of. My. Life. And honestly, they sort of stole the show a little. And you should probably go get some...like, now. They make the truffle cheese in-house, and it was creamy and melty and adequately blanketing the crispy french fries, making them the most delicious and decadent fries ever. 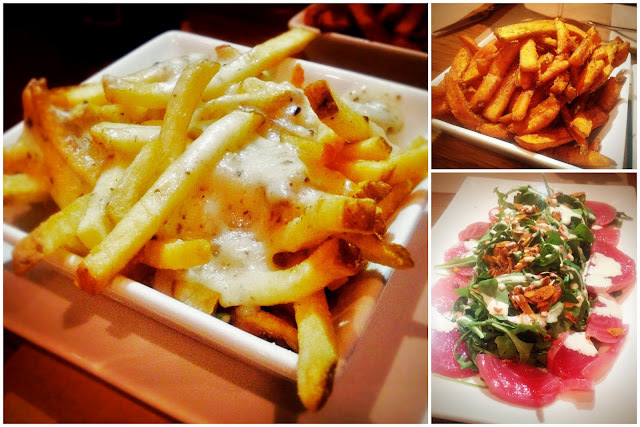 I even liked them better than the PT Fries at Park Tavern, and that's saying a lot. We also got the sweet potato fries. They were almost like having dessert because they were sprinkled with sweet salt...whatever that is. Sounds like an oxymoron if you ask me. (Guessing some combo of sugar and salt). Regardless, they were also tasty and I enjoyed dunking them in the spicy house-made diablo sauce. Also, just for the record, I've heard amazing things about the cheesy tator tots, but we did not order them. Before we get to the burgers, let me take this opportunity to apologize for the hazy "halo" photos. I recently had to swap out my iPhone for a new one and guess who forgot to take the protective coating off of the back of the phone? Yup. This girl. Not my finest photography moment. It's OK, I'm dealing with it. Instead of focusing on the photo...let's focus on what was IN the photo. DELICIOUSNESS. In fact, "Umami" in Japanese means "savory" and that's what their menu is built around. The burger on the left was mine, and it's the Greenbird. It's Diestel Farms turkey, crushed avocado, green cheese (again, what is that? ), butter lettuce and sprouts. It kinda sorta makes you feel like you're eating healthy, even though you're probably not. Despite me ordering a turkey burger at a burger joint, I was really happy with my selection. I also really adored the buttery bun that was toasted with perfection and I even loved the "U" stamped on top. Devon, our gluten free friend, got the Hatch burger minus the buttery bun. It came with roasted hatch chiles and housemade American cheese. Devon's selections were a little limited with the sauces, sides, etc. I'm actually surprised a place like this wouldn't offer a gluten-free bun of some sort or use Tamari instead of soy sauce when possible. Our favorite burger, and the one special to the Union Street location is the bacon wrapped scallop burger. I was half-expecting to see some sort of giant sea scallop of some sort, but it's actually scallops mixed with scallions, wrapped in bacon and topped with pork belly, sweet chili sauce, and yuzu garlic aioli. OK...whoever decided it was a good idea to slap pork belly on top of a scallop should be given a prize of some sort. It was so good, I almost forgot the photos turned out all weird and hazy. (OK, so I'm not over it). Anyways, I will be going back, and two things that will be on the repeat-order list: the bacon wrapped scallop burger and the truffle cheese fries. 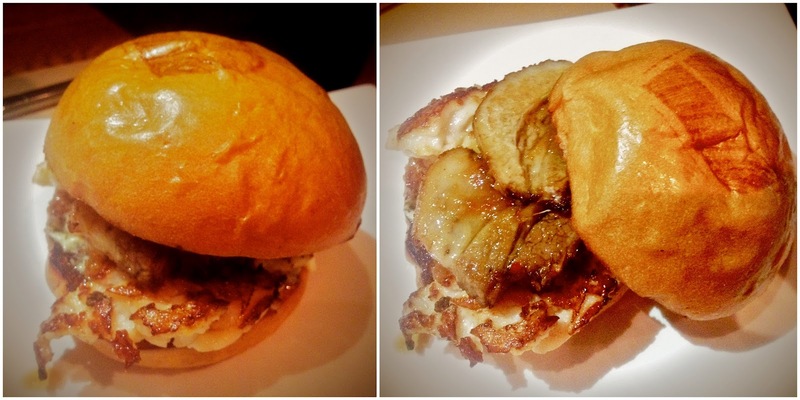 I would also like to check out the Truffle Burger, which also uses the truffle cheese, along with a truffle glaze. (They apparently like their truffles here). Oh, and the cheesy tots. See what I mean?!? Decisions are the worst. I think of a burger being plain as in just the standard basics. Never thought of it being dressed up with "chef like" care. Don't get me wrong standard basics are fine as is but I see a SF trip being formed to try out this place. Don't worry the photos get the message across of how good the food looks. Your conversational writing and sense of humor cracks me up. I have a feeling you could make a trip to 7-Eleven for hotdogs worth while. Thanks for all the 94123 love. Glad not everyone hates my 'hood. Yesterday I had the Hatch Burger at Umami-catessen in downtown LA for lunch and then the Truffle and Umami Burger from the SF location for dinner ;) I haven't had the fries or tots yet. I will have to check those out next time for sure!